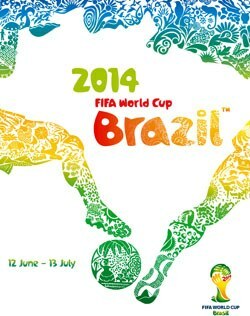 The 20th World Cup in football was held in Brazil from 12 June to 13 July in 2014. It was the second time Brazil was host for the biggest football tournament on earth, the first time was World Cup 1950. After a qualification phase including 207 teams (the team of Brazil as host nation didn't need to qualifiy), a sum of 32 teams was participating in the World Cup final stage (Bosnia and Herzegovina did partake for the first time). The FIFA World Cup in Brazil was preceded with protests and also delays in the construction and rebuilding of stadiums. It was the enormous sums involved in constructing and rebuilding football stadiums for the event that caused the protests – that also escalated in wild street demonstrations. The cost for the rebuilding of the Maracana Stadium landed on €335 million. The controversy were fueled by additional circumstances, such as construction workers died in accidents and that residents around the stadium and other World Cup related constructions was forced to leave their homes. Most chocking of all was the allegations that police death patrols had operated before the tournament in order to clear out the streets from homeless people and other undesirable elements. The matches would be played at ten stadiums in eleven cities. The final would be played in FNB Stadium in City of Johannesburg, with the capacity of 84,490. Brazil as the home team had high hopes of winning another trophy, and were a favorite because the South American teams traditionally would be known to be strong playing on their own continent – no European had never won a World Cup played at the American continent. Brazil played well and especially spectacular and dangerous for the opponent teams was Neymar. But Neymar was injured after a vicious tackling in the quarter-final against Colombia. This was most probably the biggest reason that the home team in the next match would lose by with humiliating 1-7 against Germany. Germany that seemed unbreakable forced Argentina to play defensively in the final. Argentina was well organized, but in the second part of the extra time could Mario Götze give Germany a 1-0 lead which turned out to be decisive. FIFA World Cup 2014 would include 64 matches in which 171 goals were made (2,67 goals per match). Germany would beat Argentina in the final with 1-0, after extra time. Germany	– Algeria	2–1 a.e.t. Argentina	– Switzerland	1–0 a.e.t. Belgium	– United States 2–1 a.e.t. Germany	– Argentina 1–0 a.e.t.